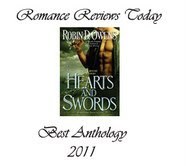 On Writing & Publishing by Robin D. Owens: More good news, Hearts and Swords! May you enjoy your day (it's cool and gray here). Congratulations, Robin. This is no surprise--the stories in Hearts and Swords are all absolutely awesome. You ROCK!!! Not surprised, it is good! ..and very selfishly hope this means more Celta books in the future! Congratulations! I too love the Heart books - great for when I'm in a bit of a "down" mood. Wonderful news! But not surprising. Hearts and Swords is a superior collection.